Friday, September 16th, 2016 at Dickens Pub, Portland-based Toxic Holocaust will headline their first Calgary appearance since 2011. Support by Disciples Of Power, The ORder Of Chaos, Fornication, Black Pestilence, and Concrete Funeral. Thursday, September 15th, 2016 at Distortion sees The Exalted Piledriver in their first ever Western Canadian performance with support from Crystal Mess, Savage Streets, Profits Of Crime, and Accostal. New this year, VIP packages will be offered and include sound check viewings, band meet and greets, and autograph sessions. 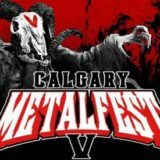 Check out CalgaryMetalfest.com and BigNateProductions.com for more info! Tickets and VIP Passes on sale through My Show Pass and CalgaryMetalfest.com and at Sloth Records in Calgary.